Over the years the popular Franklin Basin area of the Cache National Forest in Bear River Range just south of the Idaho border has been increasingly pummeled by cattle and sheep. 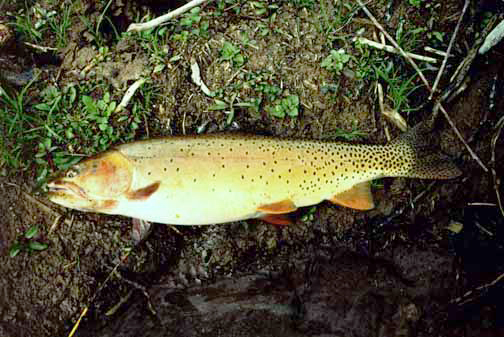 One result has been a serious decline in the Bonneville cutthroat trout. The Franklin Basin Allotment covers over 20,000 acres in the Bear River Range and on the Logan River, a critical Bonneville cutthroat trout fishery in northern Utah. The Bear River Range is the most critical wildlife corridor connecting the Greater Yellowstone Ecosystem to the Uintas and southern Rockies. The Bear River Range in Idaho and Utah is heavily grazed by livestock, has extremely high road density, and is overrun with dirt bikes and ATVs during the summer and snowmobiles during the winter. Cattle and sheep dominate the habitat, removing forage that would support thousands of deer or elk and many more sage grouse and other forms of wildlife. Plant communities such as aspen, sagebrush and conifer are dysfunctional, having lost much of their native flora with undesirable species remaining. Erosion is severe due to the loss of ground covering vegetation. The Decision by the Forest Service continued unchanged the current stocking rate of 607 cattle from June until October each year and does little to restore the admittedly degraded conditions even though their own data shows the current stocking rate is 6 times what can be supported by the available forage. [boldface mine. RM] The Forest Fishery Biologist report recognizes that Bonneville cutthroat trout populations are declining and admits that the proposal will not improve their habitat. The WWP Utah Office filed an appeal of this decision. We were joined by our partners in the Utah Environmental Congress and Wild Utah Project. The decision by the Uinta Wasatch Cache National Forest Supervisor remands the decision back to the Logan Ranger District to address improving the unsatisfactory conditions that they admit exists on the allotment. We will continue to press the Forest Service to do an objective job. That is an amazing amount of overstocking of livestock. I’m very pleased to see success stopping the Logan Ranger District. When I was a boy, going to Franklin Basin was always big excitement, but now after June each year it is just a dust bowl with some trees and coneflowers amidst the dust. It’s good to know that some of their habitat can be restored and protected. Every native specie counts. congrats to the Western Watershed group! nice work and thank you. Way to go Western Watersheds!